Are you a business owner looking for office signage to direct patrons and visitors to the proper area? 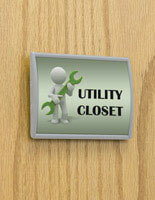 If so, these particular door sign options are an ideal solution. This office signage selection contains a number of choices for every type of business, from corporate settings to conference rooms. These units each feature a unique curved design, which enables your signage to pop out from the wall, ensuring your messages get noticed. What comes with the purchase of one of these business signage options? Double-sided foam tape is included with each office signage for easy wall mounting. A suction cup is provided with each unit to easily change out graphics. The office signage also comes with a protective, non-glare lens to ensure signage is always visible, even under the harshest light conditions. These office signage for interior use is designed for wall mounting. Each business sign comes with double-sided foam tape mounting onto the back of each frame. This enables users to quickly and easy display their corporate name plates and other types of signage in mere seconds! The office signage can also be mounted onto a solid door as well. The foam tape is also called VHB tape, or very high bond. This means that the frames are designed for one-time use. Each of these office signs is made from anodized aluminum. This rugged construction ensures these units will withstand years of use. Each office sign also comes in either a silver or black finish. These are both neutral colors, enabling the frames to coordinate with virtually any corporate or business setting. These door signs, wall mounted sign holders are designed for businesses needing to make frequent changes! Each frame includes a suction cup. This suction cup is designed to help users quickly remove the included non-glare lens. Simply depress the suction cup and lift up to remove! This design also enables users to change out graphics, without having to remove the frames from the wall! The non-glare lens is included with each lobby signholder to protect your custom graphics and name plates, as well as to prevent glare from business lighting from hindering the view of your displayed signage. Where can these lobby frames be used? The wall signage options seen here are designed for use by a variety of interior business settings. 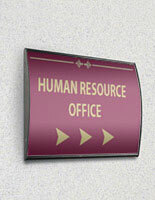 Offices generally use these signholders to display numbers or employee titles outside of a room. This allows both employees and visitors to easily identify the rooms and enter the correct one. Offices also use these merchandise to display room titles, such as "Photo Studio" or "Conference Room". These business signholders with double sided foam tape for wall mounting are often seen in a hospital or lobby area, displaying directional signage. Hospitals often purchase numerous frames and group them together, creating a way-finding or directory. This allows both visitors and patients to easily locate the department they are looking for. Such directional signage as "Oncology Center →" or "Urgent Care ←" are often displayed in these types of frames. Wallmount signage displays, like these, help to lead patrons in the right direction. 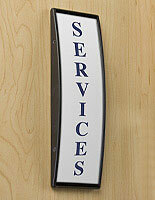 The lobby of a doctors' workplace or hotel will also use these types of signholders for similar purposes as well. Here, the frames can be used to display such custom messages as "Parking Lot → " or "Guest Check-In ← ". By grouping the units together, users are able to create signage systems, for easy navigation through the interior your institution. These door nameplates are just one of the many types of signage displays this site has to offer. This site also sells various other options to display your custom graphics, including sandwich boards, street pole banners, standoffs and more. Sidewalk sandwich boards are yet another type of poster display solution this has available for purchase. These particular fixtures are designed for use outdoors. As such, each unit is durably constructed to endure the outdoor elements, unlike signage designed for interior use. Streetpole banners are yet another type of graphic display. These units can be ordered to your specifications, with your custom artwork. Simply follow the provided instructions on each product page. This site offers a wide variety of standoffs, which are ideal for use by businesses and corporate workplaces as well. Standoffs are small decorative caps which make graphics stand off from the wall for a 3D look! This design, like that of the curved signage displays seen here, ensures your custom graphics will be noticed by passersby! Standoffs are made from a variety of materials, and come in various finishes to coordinate with any setting. Certain models are also tamperproof for added security. Displays2go is your #1 source for display fixtures and marketing solutions. In business since 1974, this company has grown from selling only hand crafted acrylic merchandise to offering over 7,000 unique merchandise. The product selection includes store fixtures, banking supplies, food displays and more. Many of these offered merchandise ship out the very same day! This company has 3 large warehouses, with over 2 million units in stock! This enables us to offer customers some of the shortest shipping lead times found everywhere on the web! Buy online with confidence when shopping with Displays2go.com!